VoIP business phone systems like RingCentral replace local landline service and offer a variety of features including phone numbers, voicemail and conference calling. We reviewed the major RingCentral competitors and narrowed it down to the top six. We then evaluated price, features, and customer support to learn which stood out and which is the best overall. Nextiva (Best Overall) Businesses wanting a great combination of features at an affordable price. Vonage Businesses wanting a la carte business phone options like call recording and conference bridge. 8x8 Businesses that want unlimited international calling for up to 47 countries. Phone.com Small businesses on a budget with low-volume calling needs. Ooma Businesses wanting a complete phone system for one straightforward monthly price. Grasshopper Solopreneurs wanting a business phone number on their mobile device or personal landline. Price – We evaluated each provider’s pricing based on how its per-user costs stacked up to other solutions on our list. Features – We assessed the types of features each provider offered, including local and toll-free phone numbers, voicemail transcription, unlimited fax, and conference calling. Local and International Calling – We evaluated whether each provider offers unlimited local and international calling. Mobile App – We assessed whether each service offered mobile apps for accessing the provider’s calling tools and features from a mobile device. CRM Integration – We evaluated whether each provider offered integration tools for CRM platforms like Freshsales, HubSpot, and Pipedrive. Customer Support – We evaluated the type of customer service support each provider offers and its hours of availability. Based on our research, we believe Nextiva is the best overall RingCentral alternative for small businesses because of its affordability, collection of features, and ease of use. Here’s how all six RingCentral competitors we evaluated stack up when we compared them against each other for price, features, and customer support. Nextiva ranks as our best VoIP provider and business phone system. It features unlimited domestic calling, free phone numbers and number porting, unlimited fax, and a conference bridge. Nextiva is the best overall choice for small businesses wanting a RingCentral alternative with a great set of features at an affordable price. Nextiva offers three competitively-priced tier packages: Office Pro, Office Pro Plus, and Office Enterprise. Prices range from $19.95 to $27.95 per user per month, and include unlimited calling, free phone numbers, and unlimited fax. Nextiva customers say the support team’s onboarding process makes the service easy and quick to set up. Users report the mobile and desktop apps are intuitive and user-friendly, although some say the dashboard is somewhat cluttered. Nextiva’s Office Pro package includes unlimited domestic calling, a free local and toll-free phone number, free number porting, and unlimited virtual fax. This tier also includes voicemail-to-text and voicemail-to-email transcription. RingCentral’s basic tier is restricted to 10 users and includes one local or toll-free number. The Nextiva Office Pro package is a good fit for small companies and teams that need basic phone service to get their company connected. However, this tier lacks the conference bridge, SMS messaging, mobile apps, and call recording features found in upper levels. It’s also missing CRM integration and media storage found in 8×8’s first-level package, but this plan is on par with other solutions on our list with similar features. Nextiva’s Office Pro Plus package adds SMS messaging, the mobile app, and Team Presence to allow users to set their availability status within the Nextiva app. This level also includes one professionally recorded greeting and a conference bridge for calls with up to nine participants. RingCentral’s mid-level plan adds unlimited users and unlimited fax. Office Pro Plus tier is right for business owners who are frequently on the road or out of the office. This tier is missing call recording and the Nextiva Anywhere app found in the provider’s highest package level. It also lacks video conferencing and call recording features offered by Vonage and 8×8, respectively. However, this plan costs less than either package and all three come with the basic set of core features like a phone number, unlimited domestic calling, and voicemail. Nextiva’s Office Enterprise package adds three professionally recorded greetings and Nextiva Anywhere, a feature that allows users to make and receive calls from any device and any location using a single phone number. It also includes inbound and outbound call recording. RingCentral’s premium plan adds call recording and video conferencing for 50 people. Office Enterprise is good for businesses that want a unified calling experience across all devices. Nextiva doesn’t offer 8×8’s media storage options or international calling plans. However, this plan costs less than upper-tier plans offered by 8×8 and other providers, so that may not be a deal breaker for businesses that don’t need cloud storage and primarily make domestic calls. Nextiva’s customer support services include an online ticketing system, live chat, and a comprehensive knowledge base. Phone support is also available from 5:00 a.m. to 6:00 p.m. AZ, Monday through Friday, and 6:00 a.m. to 6:00 p.m. AZ, Saturday and Sunday. Nextiva’s mobile app is included with Nextiva’s Pro Plus and Enterprise plans. It combines voice, instant messaging, screen sharing, and other team collaboration tools into a single application users can access from a desk phone, mobile device, or computer. The app also includes call pulling, a feature that allows users to swap devices during calls without disconnecting the call. The app is available for iPhone, Android, PC, and Mac. Nextiva is missing international calling plans like those offered by RingCentral competitor 8×8, although international calling rates billed on a per-minute basis are available. Nextiva also doesn’t offer online storage with any of its plans, though it is available through add-on plans priced from $4.95 per month. Our readers give Nextiva good reviews, with a four out of five-star rating. Customers give the service high marks for customer support and call quality. However, some users say the website portal could be more user-friendly and intuitive. Check out our article comparing Nextiva vs. Ringcentral for more in depth analysis on their differences. Businesses wanting an affordable business phone system with the best combination of standard features and reliable customer support should check out Nextiva. The company offers a free demo of its product when you contact the sales team. Visit Nextiva’s website for details. Vonage is a VoIP system and RingCentral alternative with features like CRM integration, call recording, team messaging, and video conferencing. It is a good option for businesses wanting a solution with team collaboration tools, and it’s also the right choice for companies wanting a system with a la carte options like a toll-free number and online fax. Vonage has three package choices: Mobile, Premium, and Advanced. Pricing runs from $19.99 to $29.99 per user per month and includes unlimited calling, mobile apps, and a virtual receptionist. Plans can be further enhanced with add-ons like faxing and call recording. Vonage’s pricing is on par with other RingCentral alternatives with similar features. Customers report setting up a new account is easy using Vonage’s New Customer Training online guides, videos, and live, trainer-led sessions, and that the automated walk-through process is helpful. However, some users say the mobile app falls short and could be more user-friendly. Vonage Mobile includes unlimited calling, a local phone number, voicemail, SMS messaging, and team messaging through the mobile and desktop apps. This level also includes call management tools like call hold and forwarding, call park, and call waiting. RingCentral’s basic level includes most of the same features but is limited to 10 users. Vonage Mobile is right for distributed and remote teams or businesses that don’t rely on desk phones. This tier lacks CRM integration, video conferencing, and the multi-level auto-attendant offered at the next level. It also lacks a toll-free phone number and online fax feature offered by Nextiva’s first-level price plan. However, a local number is available for an additional $9.99 per month, and a fax number is $14.99 per month. Pricing for this tier is initially equal to Nextiva, but costs add up with optional extras. Vonage Premium adds video conferencing, chat, and file sharing to desktop and mobile devices for up to 100 people. This level also includes a multi-level auto-attendant and CRM integration tools. RingCentral’s mid-level plan supports unlimited users but limits video meetings to four people. Vonage Premium is good for companies wanting a business phone system that communicates with their business apps and customer relationship tools. This tier lacks the conference bridge offered by providers like Ooma and Nextiva, but it is available as an add-on for an additional $14.99 per month, plus $0.03 per minute. Each call accommodates up to 30 participants, while Nextiva’s conference bridge allows up to nine people and Ooma’s bridge permits 10 participants. Vonage Premium’s base price is about the same as its competitors before the cost of add-on features. Vonage Advanced adds onboarding support and “call group” to forward calls to multiple extensions simultaneously. It also includes 15 hours per month of on-demand call recording that allows employees to decide when they want to record calls. RingCentral’s premium plan also adds call recording, but not onboarding support. Vonage Advanced is a good choice for companies wanting a dedicated support team to assist with setup and onboarding. Vonage plans do include basic company-wide and individual call summaries. However, this tier lacks the more robust call analytics and reporting offered by 8×8 and Phone.com’s upper-level packages. This level’s pricing is on par with most of the providers on our list that don’t include inherently expensive features like unlimited international calling. Vonage customer support includes a community forum, an online ticketing system, a comprehensive knowledge base, and live chat. Phone support is available from 8:00 a.m. to 12:00 a.m. EDT, Monday through Friday, and 9:00 a.m. to 9:00 p.m. EDT, Saturday and Sunday. Emergency on-call, after-hours support is also available. Vonage’s mobile app is included with all plan levels. Features include calling and texting through the Vonage Business phone number and access to contacts. Users can collaborate with colleagues via group text, media sharing, and video calls, as well as manage availability with call forwarding and Do Not Disturb. The app is available for iPhone and Android devices. Vonage is missing CRM integration with some popular business apps like Salesforce and Dropbox. It’s also missing international calling bundles as offered by RingCentral competitor 8×8; however, per-minute calling rates are available to all customers. Our readers give Vonage mixed reviews with a three-star out of five-star rating. Customers report it’s easy to customize the service to your individual business needs and that call quality is solid. However, some users say porting phone numbers took longer than expected. Businesses wanting an alternative to RingCentral with features and options that scale to their particular business needs should take a look at Vonage. The company offers a 14-day free trial to try before signing up for an account. Visit Vonage’s website for details. 8×8 is a business phone service provider with unlimited international calling plans to up to 47 countries. It features a phone number, audio and video conferencing, voicemail, CRM integration, and an auto-attendant. 8×8 is a good alternative to RingCentral for businesses with a global presence that make a lot of international calls. 8×8 offers three price plans: X2, X5, and X8. Prices range from $25 to $55 per user per month and include unlimited international calling from 14 to 47 countries, depending on the plan you select. All plans also offer a phone number, voicemail, media storage, audio attendant, a mobile app, and CRM integration. 8×8 users say the setup process is quick and easy, and the onboarding team is responsive if any questions come up along the way. Customers report the dashboards and configuration menus are intuitive, but the web portal can be difficult to navigate the first few times. 8×8’s X2 package includes a phone number, unlimited calling to 14 countries, audio and video conferencing for up to five people, and 1 GB of media storage. This level also includes voicemail, team messaging, an auto-attendant, and CRM integration. RingCentral’s basic plan doesn’t include global calling or media storage. 8×8 X2 is a good choice for businesses that want CRM integration when making international calls. This plan lacks call recording and the operator switchboard features found in the upper-level packages. It’s also missing Nextiva’s free number porting offered on its first tier level. This plan costs a few dollars more than other solutions on our list, but it is the only one that offers unlimited international calling zones at every price point. 8×8’s X5 package adds call conferencing for up to 25 people, call recording, 5 GB of media storage, and unlimited international calling to 32 countries. RingCentral’s mid-level plan limits conference calling to four people and doesn’t include call recording. 8×8 X5 is right for businesses that want a larger global calling radius and the option to record calls. The X5 plan lacks the contact center and analytics features found in the next tier. It’s also missing Nextiva’s voicemail transcription options. 8×8’s X5 mid-level package costs about the same as the upper-level package of other business phone system providers on the market. 8×8’s X8 package adds a contact center package with 2,000 domestic calling minutes and three months of call recording storage. Additional contact center features include predictive, progressive, and preview auto-dialers and interactive voice response technology. RingCentral’s premium plan doesn’t include auto-dialers or call recording storage. 8×8 X8 is right for companies wanting a business phone system with contact center integration. 8×8 lacks integrations with Dropbox, Salesforce, and Microsoft. 8×8’s X8 plan is also more expensive than some of its competitors, but businesses that make a lot of international calls may prefer an unlimited calling plan over a per-minute rate offered by other providers. 8×8 customer support includes an online knowledge base, ticketing support, 24/7 live chat, and phone support. 8X8 also offers crowdsourced support on its website from its most active power users. These experts use their knowledge and experience to help customers troubleshoot common technical issues in exchange for rewards from 8×8. 8×8’s mobile app is included with all plan levels. Features include click-to-dial from the company or personal directory, voicemail access, video and audio conference calling, and SMS messaging. The app also includes unified team messaging and collaboration. 8×8’s mobile app is available for iPhone, iPad, and Android devices. 8×8 is missing voicemail transcription-to-text or email as offered by RingCentral competitors like Nextiva and Phone.com. The service also lacks integration with Google Suite, Gmail, and Dropbox. Customers say the service is priced well and offers a lot of features for the money. However, our readers give 8×8 low marks, with a two-star out of five-star rating. These users report regular system disruptions and say customer service can be unreliable, which is worth considering when making purchasing decisions. Businesses wanting an affordable, feature-rich alternative to RingCentral with unlimited global calling plans should check out 8×8. Call a solutions specialist at the company’s toll-free number to sign up for an account or request a customized quote through 8×8’s website. Phone.com is a low-cost business phone service that provides customers with phone numbers and bundles of minutes. It also features SMS messaging, call conferencing, an auto-attendant, and voicemail. Phone.com is a good RingCentral alternative for small businesses that don’t make a lot of calls or need packages with unlimited minutes. Phone.com offers three price plans: Base, Plus, and Pro. Prices range from $12.99, which is below industry average, to a competitively-priced $39.99 per month. Plans include local or toll-free phone numbers, a bundle of call minutes, and a bundle of SMS messages. Additional features include an auto-attendant, call conferencing, and call analytics. Phone.com users report that the service is easy to use, and includes features that can scale with your company as your business grows. The system also offers integrations with third-party CRM systems like Salesforce and Zoho CRM, similar to what is offered by RingCentral, giving users the ability to manage their calls and contacts from within a more robust sales tool. Phone.com’s Base plan includes one local or toll-free phone number with 300 minutes of calling time. This level also includes 5,000 SMS messages, an auto-attendant, call conferencing, and voicemail-to-email. RingCentral’s basic plan features unlimited calling and SMS, but limits conference calls to four people. The Base plan is a good choice for solo business owners or small teams that don’t need a lot of calling minutes compared to other no-frills RingCentral alternatives. This level lacks the voicemail-to-text and premium hold music features found in Phone.com’s mid-level plan. It’s also missing the team messaging and media storage offered with 8×8’s basic plan. This is one of the lowest-priced plans on our list, but costs add up if you add additional minute bundles or incur overage charges. Phone.com’s Plus plan includes two local or toll-free phone numbers with 500 minutes of calling time. This level also includes 10,000 SMS messages, voicemail-to-text, and premium hold music. RingCentral’s mid-level plan features a multi-level auto-attendant and places no limits on calls or texting. The Plus tier is a good match for businesses that favor text and SMS messaging over voice calling. This tier lacks the call analytics and video conferencing features found in the Phone.com’s highest-level plan. It also doesn’t include CRM integration offered by other RingCentral competitors on our list, like Vonage and 8×8. However, this feature is available as an add-on by calling Phone.com’s sales team for a quote. The Plus plan costs about the same as other mid-level business phone systems on the market. Phone.com’s Pro plan includes three local or toll-free phone number with 1,000 minutes of calling time. This level also includes 20,000 SMS messages, call analytics, call record and save, and video conferencing for up to 25 participants. RingCentral’s premium plan features CRM integration and conferencing for up to 100 people. The Pro plan is a good match for businesses wanting tools to monitor, review, analyze, and save calls and call data. This level doesn’t include online storage options like RingCentral alternative 8×8. Unlike Nextiva, it also doesn’t include professionally-recorded greetings. However, professional recordings are available as an add-on option starting at $79. The Pro plan’s pricing is about the same as other upper-level business phone plans on the market. Phone.com customer support includes an online knowledge base, user manuals, and training guides. Email, live chat, and phone support are also available 365 days a year. Customer support in Spanish is available Monday to Friday, 8:00 a.m. to 6:00 p.m. PST. Phone.com’s mobile app is included with all plan levels. Features include visual voicemail, SMS text messaging, and conference calling. Customers can also receive faxes and set custom caller ID numbers to keep personal phone numbers private when making outbound calls. Phone.com’s mobile app is available for iPhone, iPad, and Android devices. Phone.com doesn’t offer unlimited calling with any of its plans, like RingCentral competitors Nextiva and Vonage. However, the option is available as an add-on feature for $23.99 per month per extension. Our readers give Phone.com mixed reviews with a three-star out of five-star rating. Customers like that the service is affordable and that the plans are flexible. However, customer service experience reports include delayed responses and unhelpful staff. For more user reviews, visit our Phone.com User Review Page. Businesses that don’t make a high volume of calls or need plans with unlimited minutes should consider Phone.com. Base plans include a 30-day money back guarantee. Visit Phone.com’s website for details or to set up an account. Ooma is a VoIP business phone system with features that include voicemail, call management tools, and a virtual receptionist. It also offers auto-forward during device outages and E911 service where supported. Companies wanting a RingCentral alternative that includes all available features for one straightforward monthly price—rather than tiered pricing—should consider Ooma. Ooma’s pricing is $19.95 per user per month, along with a one-time hardware charge of $199.99 base station and two wireless Linx devices. Accounts include one local or toll-free phone number, a virtual fax number, and a conference line number. Additional local or toll-free numbers are available for $9.95 each per month. Ooma customers report the system is quick to set up and the virtual receptionist is easy to navigate. Users say it’s also easy to customize the phone options online. However, some say the mobile app interface can be confusing. Ooma’s features include unlimited calling to the U.S., Canada, Mexico, and Puerto Rico, a virtual receptionist, a conference bridge, voicemail, and call management tools. Ooma doesn’t offer as many features as other RingCentral alternatives but, but unlike other providers, they are all available for unlimited users for a single monthly price. Ooma’s call management tools include voicemail, call transfer, park, and call forwarding to mobile devices. Like RingCentral, Ooma also offers “ring group,” a feature that allows multiple phones to ring simultaneously when one number or extension is dialed. Each user extension includes a voicemail box with a personalized greeting and an individual portal to check call logs, listen to voicemail, and send faxes, as does RingCentral. Ooma’s virtual receptionist routes calls by name or extension number to a virtual extension, physical extension, ring group, or voicemail box. The virtual receptionist also includes greeting configuration options for business hours, and after-hour calls and tools to allow users to create personalized company greetings and announcements. RingCentral’s auto-attendant, available with mid-level plans and higher, offers similar greeting and routing features. Ooma accounts include a local phone number and a toll-free number with 500 minutes of inbound calls per month. Businesses can port one existing number free of charge. Additional ported phone numbers and new local or toll-free numbers are billed at $9.95 per number per month. Each RingCentral plan includes one local or toll-free number with unlimited domestic calling and 100 to 2,500 toll-free calling minutes, depending on the plan. Ooma provides E911 emergency calling services where locally supported. However, there are some important limitations to keep in mind. Power and a working broadband internet connection are required for Ooma to provide 911 service, and 911 calls are not available from Ooma’s mobile app. RingCentral also supports E911 service, and the same limitations apply. Ooma customer support includes an online knowledge base, video tutorials, user manuals, and community forums where users can share ideas and suggestions. Live chat and 24/7 phone support are also available. Ooma’s mobile app is available for all customers. Features include voicemail access, outbound Caller ID with the user’s Ooma phone number, call transfer, and Wi-Fi calling. Customers can also access Ooma’s virtual receptionist and user accounts through the app. Ooma’s mobile app is available for iPhone and Android devices. Ooma is missing a video conferencing feature as offered by RingCentral competitors like Vonage and 8×8. Ooma also lacks a low-cost point of entry for new customers due to the upfront costs associated with the hardware equipment purchase necessary to set up the service for the first time. Our readers give Ooma high marks with a four-star out of five-star rating. Customers emphasize the intuitive user interface and say customer service is responsive. However, some users were disappointed to discover it’s only possible to port phone numbers, not extension numbers. For more user reviews, visit our Ooma User Review Page. Businesses wanting an alternative to RingCentral with a set of standard business phone features at an all-inclusive monthly price should take a look at Ooma. The company offers a 30-day money back guarantee and a live, hands-on demo when you contact the sales team. Visit Ooma’s website for details. Grasshopper is a VoIP solution and RingCentral alternative with unlimited domestic calling, user extensions, voicemail, and inbound fax. Grasshopper is right for solo entrepreneurs or very small business owners who want a business phone number on their mobile device or personal landline while ensuring phone communication appears professional to callers. Grasshopper offers three plans that include the same features, like a local phone number, unlimited calling, and voicemail, for one monthly price. The $29 Solo plan includes one number and three extensions, the $49 Partner plan has three numbers and six extensions, and the $89 Small Business plan includes five numbers and unlimited extensions. Grasshopper customers say setup is quick and easy, taking only about 30 minutes. Users report the mobile and desktop apps are intuitive and easy to navigate, with a short learning curve. Users who encounter any issues while setting up or learning their way around the service can consult the free online video tutorials and content guides to get up to speed. Grasshopper’s features include unlimited domestic calling, voicemail and voicemail transcription, call forwarding, inbound fax, business texting, custom greeting, desktop and mobile apps, and Wi-Fi calling. International calling is available at a per-minute rate based on location, and additional phone numbers are available for a small fee through the customer support team. Grasshopper’s call management tools include voicemail and voicemail transcription, call forwarding and screening, and conference calling for up to 10 participants. Customers can also use the desktop app to view voicemail and call logs and to make and receive calls over Wi-Fi. RingCentral offers similar call management tools and conference calling for four to 100 people, depending on the plan. Grasshopper doesn’t offer a full-featured virtual receptionist like Nextiva, Vonage, or 8×8. However, users can record personalized messages and announcements via Grasshopper’s desktop app to use with the system’s custom phone greeting feature that plays automatically when a customer calls. RingCentral’s auto-attendant features similar custom greeting options for inbound calls. Grasshopper accounts include one to five phone numbers and a bundle of extensions, depending on the plan selected. Additional phone numbers are available for a small fee, and extra extensions can be added by contacting customer support. RingCentral plans come with one local or toll-free phone number and unlimited extensions. Additional local and toll-free numbers are available for $4.99 per month. Grasshopper does not provide E911 service support. However, its technology does not interfere with your mobile device or landline’s dial tone or ability to make local 911 emergency calls. According to Grasshopper’s terms of service, in the event of an emergency while using Grasshopper, hang up and dial the local emergency number in your area for assistance. RingCentral offers E911 service where locally supported. Grasshopper customer support includes an online knowledge base, video tutorials, and a quick-start guide for setting up the iPhone and desktop apps. The support team is also available via email and 24/7 phone support. Grasshopper’s mobile app is included with all plan levels. Features include calling and texting using your Grasshopper phone number, access to call history, sign and email faxes and PDFs, and Wi-Fi calling. Voice and data access is required for the app to work. Grasshopper’s mobile app is available for iPhone and Android devices. Grasshopper is missing the CRM integration tools, video conferencing, and team collaboration tools offered by other RingCentral competitors on our list, like 8×8 and Vonage. Grasshopper also lacks the range of customer support options offered by other providers (like RingCentral) such as live chat and an online ticketing system. Our readers give Grasshopper mixed reviews, with an average rating of three out of five stars. Customers say the pricing is affordable and accounts are easy to set up. However, users say tech support can be slow to respond and product updates can temporarily affect usability. For more user reviews, visit our Grasshopper User Review Page. Solopreneurs and very small business owners wanting a RingCentral alternative that offers virtual business phone numbers for personal phones should check out Grasshopper. Call the sales team or visit the company website for more information or to set up an account. 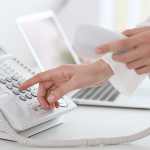 VoIP business phone systems like RingCentral replace landlines as a primary communication method for communicating with clients and customers. They are packed with features like call management tools, call recording, virtual fax, international calling, and CRM integration that may be available from RingCentral competitors at a lower cost or easier for small businesses to set up. Read our article for more on RingCentral pricing and features. Businesses that want an easy-to-use RingCentral alternative with a great combination of features at an affordable price should check out Nextiva. It features unlimited calling, a free local phone number, voicemail, free local phone number porting, and unlimited fax. The company offers a free demo of its product when you contact the sales team. Visit Nextiva’s website for details. Thanks for flagging this for us. Thanks! We do our best to make our articles practical and helpful. Appreciate your comment! How to start a business is a major focus of our website – we actually have a whole homepage dedicated to the subject here. Our focus is the United States, but many of the general lessons we speak about should apply – like choosing a business name, registering a domain, advertising on Google, etc. What country/countries are you looking to operate in specifically? Unfortunately I can’t be of much help. A quick search “nigeria voip franchise” and a few companies come up – such as ADESEMI. But it’s not clear if there are franchise opportunities available. seems like ringcentral and alternatives do too much and costs too much for my simple need. Hi Chandler, what you’re looking for is an auto-attendant. This is essentially a “smart” answering machine that can play different messages and route the call to different employees (i.e. your receptionist) depending on what button a caller presses. We recommend Phone.com since they start at just $12.21 a month (+3.9 cents per minute). You can check out our full comparison of auto attendants here. Also check out Nextiva Connect, esp if you want professional voicemail along with the auto attendant.